A guide to Amish furniture in Maine The 3 Amish communities in Maine may not be large, but are the only Amish presence in New England. And with their own resident Amish woodworkers, they’re the places to get direct-from-the-source Amish furniture in the Pine Tree State. Non-Amish furniture dealers also sell Amish products in Maine, within range of Portland, Bangor, Auburn, and other cities. Amish furniture has gained renown for its high quality and attention to detail, use of top-notch materials such as solid hardwoods (oak, cherry, maple, walnut) and fine finishes, as well as its surprising range and diversity (from traditional styles such as Shaker, Mission, and Queen Anne, to modern designs). Beds, tables, chairs, desks, bookcases, rockers, and outdoor furniture are among the many varieties offered by Amish wood craftsmen. Featuring Ohio Amish bedrooms and dining rooms, crafted in quality solid hardwoods such as cherry, oak, quarter-sawn oak, black walnut, and maple. Furniture varieties include tables, chairs, hutches, dining tables, curio cabinets, bedframes, chests of drawers, nightstands, dressers, mirrors. Amish furniture styles include classic, Heritage, Mission. Amish rockers, gliders, hickory furniture, coffee tables, benches, hall seats, mirrors, and special order furniture. Amish-owned and operated business crafting furniture, vanities, and custom cabinets. The Amish Furniture Guide main page features a full directory of Amish furniture dealers in the United States and Canada. Note to Maine residents: Please be sure to check opening hours of any Amish furniture businesses listed in this guide before traveling long distances to visit them. While we strive to keep this directory up-to-date, business locations and availability can change. Not responsible for changes to information. Maine is unusual among New England states for its Amish communities. As the only state in the region with an Amish presence, Maine also contains the area’s only Amish woodworkers. Maine Amish communities include 2 in Aroostook County–at Fort Fairfield, and Smyrna–and one in Waldo County, near the town of Unity. Amish woodworkers in Maine and other states enjoy a positive reputation thanks to their commitment to work well-done, an emphasis on quality revolving around top-notch materials such as solid hardwoods, as well as their low-cost orientation which allows them to pass savings on to their furniture buyers. Though Amish-made furniture is not always the cheapest, it typically represents a good long-term choice due to its quality and durability. All of these aspects help to provide great value to Amish furniture purchasers. As Amish migrate to less-typical locations, such as Maine, the Southern states, and the West, they often make a living in their new locations through small business. 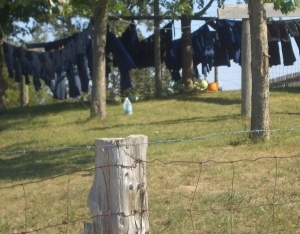 Popular enterprises among Amish include dry goods stores, machine shops, crafts businesses, and health-related businesses. Perhaps the most popular trade among Amish entrepreneurs is woodworking. Wood furniture craftsmanship allows Amish artisans to use manual skills while harnessing powers of creativity and the productive output typical to Amish labor. Amish woodworking shops are typically situated at the home, where family members or Amish neighbors are employed. The small-scale orientation often means the owner will work right alongside his employees. Visiting an Amish furniture shop in Maine or elsewhere, you have a good chance of being able to meet both the proprietor and the craftsman who creates your furniture piece–often one and the same. This small-scale appeal offers furniture consumers an experience difficult or impossible to replicate among furniture imports or big-box furniture producers. When searching for Amish furniture, Maine residents have a few options. One of the most appealing is to visit an Amish furniture shop in person. Many Amish do custom furniture work in addition to maintaining a standard furniture line. Since Amish businesspeople aim to please their customers, they generally have few qualms about creating furniture pieces that would otherwise be out-of-place in an Amish home. This adaptability is born of practicality and in recognition of the needs of a largely non-Amish furniture market. Visiting Amish furniture workshops is possible in Maine and other states. In Maine, Amish communities can be found near the towns of Unity in central Maine, and Smyrna and Fort Fairfield in the northern half of the state. The Unity settlement, the youngest in the state, is the closest to larger cities in Maine such as Portland and Bangor. In addition to a direct visit to an Amish furniture craftsman, potential buyers can also patronize one of the Maine Amish furniture sellers, with a location each in south-central and northern Maine. Too far to go for Amish furniture? Consider ordering online. I WOULD LIKE PRICING & AVAILABILITY FOR A SHED. POSSIBLES AN A FRAME ABOUT 12’X 16 OR 12’X 24′. PLEASE LET ME KNOW. How much would it be for a queen cedar log bed, including headboard and footboard with side rails and slats? Do you make a 48 inch hickory television stand? If so, what would the cost be? I purchased a hickory pub table and stools and would like a matching tv stand. We are interested in a shed before August 2014, in the Caribou area of Maine. We would like the building to be 12×30 with porch on the front and a second level. If I can talk to someone about this, since my husband has special wants on this struture,that would be helpful. lists Hill View Mini Barns with four locations in Maine: Etna, Lyman, Sabattus, and Holden. Call 207-269-2800. Another possibility is Sturdi-Built Storage Buildings in Smyrna, Maine. I’m not sure how they spell it, or which address they have, but they make sheds! Do they build small homes as well? We own land in Cooper, Maine and would like to build a small two bedroom, one story home. Is there someone I can contact for pricing on building a small cottage size home? Do you build utility trailers? we ordered a queen bed on Dec 31,2018 from Fortins furniture, we were then told it ould take about 2-3 weeks fro my bed to come in, it’s now 8 weeks later and still they tell me it isn’t in yet? is it being built or not? You should contact them directly Rochelle. This is just an informational listings page, not associated with that company. I hope you can get it sorted out.